Featured in Boston Magazine, Alder Brook Cottage is an inspired, rustic dream cottage located in the woods of the Northeast Kingdom of Vermont. Surrounded by a crystal clear stream and 1400 acres of forest, it is the perfect getaway for glampers looking to experience the tiny house life. A short drive from many lakes, rivers, and ski resorts. Whether you're sitting in front of the wood stove or exploring the cliffs and mountainside behind the house, you're bound to have an unforgettable time. 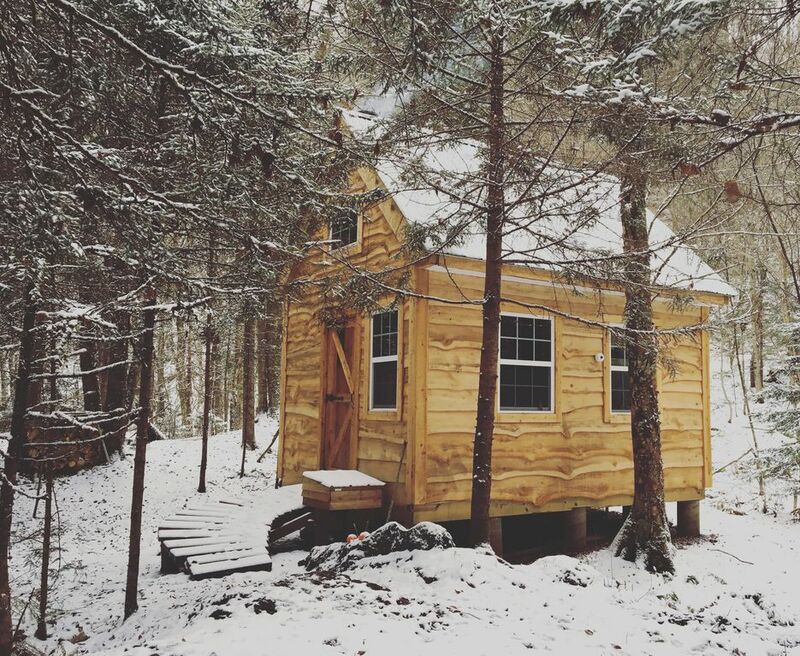 When I was little, I had a dream in which I lived in a tiny house in the woods—I still remember every detail of it. Twenty years later in 2015, my girlfriend and I decided we wanted to give the idea a go. We found this amazing piece of land and built the house ourselves, and have just finished it recently. Once you cross the footbridge and walk into the woods, you'll find the cottage. Inside you'll find a beautiful, bright space with rustic, wide-plank pine floors and a dazzling pallet wood ceiling. There is a kitchenette, a wood stove, a bathroom with a composting toilet and a sailor shower basin (you'll need to heat your own water and suspend it above the shower, now that the freezing months are here), a stove and oven, a luxurious queen-sized bed in the loft upstairs, and a fold-out daybed that sleeps 2 more. - when the weather is freezing, you'll have to haul your own water and take a sailor shower (October-May). ~2 gallons per person, per day. - we use a composting toilet. Pee goes into an easy-to-empty compartment, and guests need to empty their own pee (by pouring it around the base of mature trees outside). Parking is across the street from the neighbor's house. We specifically did not want a driveway to the cottage; to access it, you must cross a foot bridge and take a secret rock staircase up to the trail. It's about 1-2 minutes from your car. No shoes in the house! A waterproof shoebox is located right outside the front door. **Winter: the cottage in winter is magical, though things are a bit more rustic. The walk up is icy and snowy, and you have to ensure that any water you haul doesn't freeze inside the house! - there is no electricity other than our generator (hence no wifi, and cell reception is spotty) - there is no running water—we provide a few gallons for drinking and showering, but you'll have to bring your own if you need extra. - we use a composting toilet! Pee goes into an easy-to-empty compartment, and guests need to empty their own pee (by pouring it around the base of mature trees outside). - in occasional heavy rain, the stream swells and the stepping stones become unusable. In this scenario, you have to cross on a ladder or by wading.